CareCredit® and Alphaeon Credit financing only a click away. 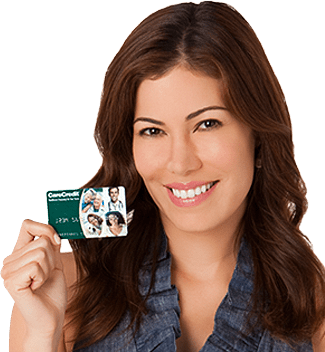 Model displaying a CareCredit® card, photo courtesy of CareCredit®. CareCredit® is the card designed specifically for your health and beauty needs such as your upcoming breast augmentation surgery. So now the decision is in your hands to get the look you've always wanted. CareCredit® offers both No Interest if Paid in Full for up to 18 months or Reduced APR for up to 60 months. Standard variable APR of 26.99%, based on the Prime Rate, Minimum Interest is $2.00 per credit plan. Call us at (480) 970-2580 and let us know that you have been approved and would like to schedule surgery. Use your new Alphaeon Credit to pay and choose your payment plan. Terms and conditions apply for all plans. Refer to the Alphaeon Credit website for details.